A few weeks ago, GREY2K USA was contacted by a woman named Leslie Wootten, who claimed to be an "independent" journalist working on a news story. We became concerned, however, when this "reporter" refused to identify who she was reporting for. Also, her "interview" was nothing more than a series of biased questions. Jen Krebs' words appear everywhere (in seems) on behalf of Grey2K. She treats this duty like a full-time job (which it may be), so I certainly agree that articulate replies from credible sources should be ready to lob back each and every time she's on the loose. Setting aside the fact that she is completely wrong about Jennifer, who is a volunteer board member, this message exposes Wootten's real agenda: protecting the greyhound racing industry. It isn't just people employed by the racing industry who oppose their ballot question to ban racing. 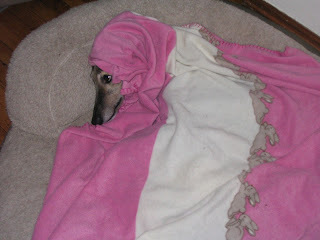 A lot of greyhound adoption people believe that racing is a great life for these dogs, who are bred to run. The "article" published this morning by Wootten and Goree falsely claims that GREY2K USA does not support greyhound adoption, and does not care about ending greyhound racing in other countries. This is completely false. Although we are not an adoption group, GREY2k USA strongly supports adoption efforts. Over the years, we have made donations to dozens of non-profit adoption groups across the country. We give adoption referrals on an ongoing basis, promote adoption through links on our website, and regularly encourage all of our supporters to consider adopting a greyhound. I have also personally adopted a beautiful greyhound named Zoe, and am honored to share my life with her. Regarding greyhound racing in other countries, we are deeply committed to helping prevent the spread of greyhound racing, and ending it in the countries where it does exist. In recent years, we have fought for the greyhounds in countries across the world, including Guam, the United Kingdom, South Africa, Australia, Jamaica, the Philippines, and other countries. For example, in Guam we helped write legislation that prohibited greyhound racing, and the law was based on the ballot initiative voters previously had approved in Massachusetts. If Wootten and Goree had truly been interested in reporting the facts, they would have included these efforts in their "article." In the end, however, I'm not really surprised that the truth about our work ended up on the cutting room floor. From the beginning, their apparent goal was to raise false issues about GREY2K USA and greyhound adoption, and in doing so perpetuate the cruelty of greyhound racing. The whole dog industry is in such a decline that the supporters' backs are against the wall and they are lashing out. They are attempting to do damage control which, at the moment, is almost as big a task for them as it is for Charlie Sheen's PR person. Greyhound racing is soon coming to an end and they know it. If all they have is name calling and "lobbing" as Wooten wrote in the blog, well, that's not a whole hell of a lot of anything worth worrying about. The public sees them for who they really are and always have been - promoters of cruelty for cash. It's people like Wooteen and Gorri who turned me off to most adoption groups. They are self serving. The lies about Grey2K not supporting adoption are widespread. Friends i had made through these groups have turned their backs on me because of my anti racing stance. I don't need friends like that. And neither do greyhounds. Just unbelievable and ridiculous. The efforts of GREY2K USA have saved thousands of greyhounds from racing. Wooteen and Gorri, if they want to call themselves "reporters", have lost total credibility, if they ever had any. And I question that. Keep up the great work. As Val said, their backs are against the wall. Their latest assault will backfire. Its sad really that someone would go to such lengths to hurt the image of another who tries to do good. Like people who take political sides, constantly criticising one another when in fact we would all have so much more to gain by working together. I suppose in an ideal world that would make sense. It's animal cruelty pure and simple; to try and discredit GREY2K's efforts is absurd. I have two greyhounds and both my husband and I volunteer for our local adoption group. Meanwhile, our handsome Moeman is December in GREY2K's 2011 calendar. We are all on the same team folks. These faux journalist are just attempting to divide and conquer. Good luck with that. Its sad really that someone would go to such programs to harm the impression of another who tries to do excellent. Like individuals who take governmental ends, regularly criticising one another when actually we would all have so much more to obtain by family interaction. I think in an suitable community that would add up.